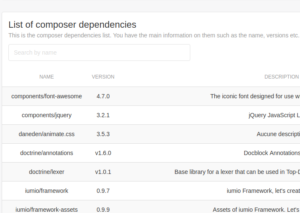 The composer manager on FGM offer a possibility to search an installed dependency. To search it, please tap on the search box, the keyword you want. You will see the bord filtered with you search matches. To retrieve all dependencies list, please delete your keyword in the search box.